Ghost Adventures burst onto the TV scene first as a documentary on the SyFy channel in July of 2007 and aired its first series episode in 2008 on the Travel Channel. Since then, Ghost Adventures has held the rapt attention of paranormal fans. Led by ghost hunter Zak Bagans, the show focuses on dark hauntings and an extremely confrontational approach to ghost hunting, the Travel Channel's Ghost Adventures is now appointment television for millions of fans around the world. Ghost Adventures airs on Saturday nights on the Travel Channel. The crew, led by Zak Bagans, travels to some of the most notoriously haunted locations in the world, where they are locked in overnight. According to Bagans, there is no camera or sound crew. Instead, the crew members go it alone. The crew of Ghost Adventures has changed over the years, starting with original cast members Zak Bagans, Nick Groff, and Aaron Goodwin. In his 20s at the time, Zak Bagans didn't believe in ghosts until he lived in an old apartment in Trenton, Michigan. In his first month of living there, he had a ghostly encounter that set him on a search for answers. Now in his 40s, Bagans has had a lifelong interest in the paranormal. Now he combines that fascination with his experience as film maker to bring the experience to the small screen. Nick Groff also had a lifelong interest in the paranormal as well as a film school background. He and Bagans met when Bagans was the wedding DJ for Groff's wedding. The two hit it off and discovered a mutual love of the paranormal. Groff left the show in 2014 and later filmed Paranormal Lockdown with Paranormal State's Katrina Weidman. Aaron Goodwin is an experienced cameraman who was a friend of Groff's. 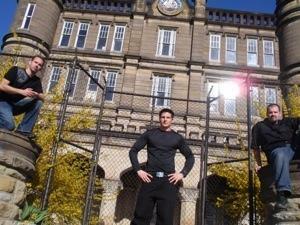 When Groff and Bagans decided to embark on their paranormal adventure, they took Goodwin along to document their experiences. Most of the camera work in the documentary and series comes from Goodwin's camera. As of 2019, Bagans and Goodwin remain on Ghost Adventures along with two new members, Billy Tolley and Jay Wasley. In 2006, Bagans jumped into a car with Groff and Goodwin and went to explore the old mining towns of Nevada. What resulted was footage they put together into their documentary that captured the imagination of paranormal enthusiasts. The most significant piece of footage on that trip occurred at Nevada's Goldfield Hotel where they captured a brick flying in a whirlwind in the basement of the abandoned building. The three were terrified - and hooked. Returning from their trip, the three put together some of their best raw footage into a feature-length film. They started entering the film in film festivals. The documentary was nominated for the Best Feature Film at the Eerie Horror Film festival and won the Grand Jury prize at the New York Independent Film and Video Festival. Shortly after that, the documentary was picked up by SyFy, and a year later, the Travel Channel aired the series in the popular Saturday night prime time slot. The Ghost Adventures crew is known for their highly confrontational style. Known as provoking, the theory behind talking tough to ghosts is that the emotional energy invested in provoking may stir up a haunt - especially a darker one. The crew places themselves in scary situations in pursuit of evidence, often isolating one of the members to sit in the most active spots of the location they are investigating. This approach has turned up a number of interesting results including EVP (electronic voice phenomenon), video and photographic anomalies, and a dark figure captured using a method called ITC (instrumental transcommunication.) It is an approach that has been imitated by thousands of would-be paranormal investigators since 2007. All evidence they gather is reviewed by independent experts, such as audio, video and photographic experts. The experts can help rule out the more mundane explanations for the evidence that they gather making it more likely that the origin of the remaining evidence may be paranormal. The team specializes in what they refer to as dark or demonic" hauntings. While they search for ghosts, they claim their investigations are actually driven by a desire to help the living - especially those terrified by dark entities that may occupy their homes or businesses. They work with experts to help deal with the dark nature of many of the hauntings, including a Catholic archbishop who specializes in demonology. If you've never seen the show and you have a fascination for the paranormal, you're sure to love the combination of high emotion, scary evidence and adrenaline that characterizes the show. Tune in to the Travel Channel and let Bagans and crew take you on an adventure.